Whenever I come across an album like this, a rare occurrence, initially I cannot help wondering whether it makes any sense to put it out into the world in the first place. 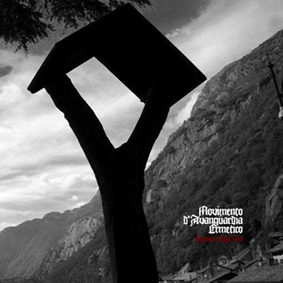 The band from Piemonte (north-west of Italy) clothes an absolute, existential form of philosophy with black metal robes which have no resemblance to those we see on magazines or most fanzines. These are the robes of the ascetic, not in the Christian sense but in the aristocratic sense. Here the intellect, a spirited form of thirst that makes you jump into the ruthless fire of awareness, sustains everything. Music is a mere reflection of an intense, grueling challenge where you single-mindedly pursue the thrill/pain of abandoning yourself to the innermost source of ancestral, shamanic “truths”. Coupling a deeply meditative kind of cognitive introspection to an extensive and heterodox type of knowledge, with determination and perseverance, will demolish boundaries, subvert what is commonly accepted, reclaim what has been hidden to us, gives impetus to pursue a way of life that seeks inner and outer adventures that are truly authentic, meaningful and exhilarating, often reckless (from the point of view of the herd). And when you are in that tremendous place of Spartan solitude, inevitably you look down on those who live a life of slavery to a system that holds them hostage through lies and constant offerings of unnecessary, meaningless goods, you begin to feel disgust for those who choose not to see, those who worship plastic shallowness.